Working on some KA-1s. The crossover is very complex: three 25uF caps, three 20uF caps and one 10uF. Also a 30 ohm resistor and three 2.5 ohm resistors. 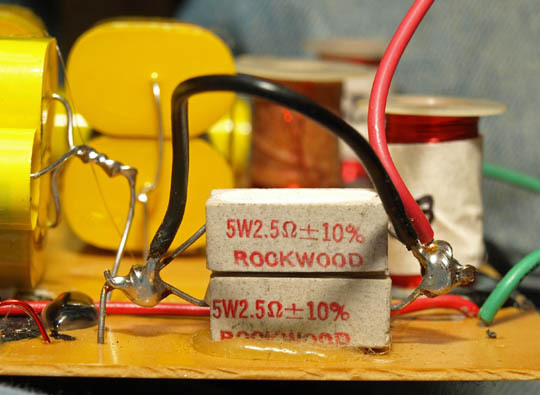 Four smaller inductors and 1 larger. Here's the thing: at one point in the circuit, there are two 2.5 ohm resistors in parallel, with a black wire jumped from one end to the other. In other words, a short circuit. I have no idea why the resistors are even in there! Can anyone help with this? Here's a photo. Thanks to Paolo I have the schematic and thanks to John O' we'll have one with all the values to post. Re: The above photo. Those resistors are not on the schematic. John figures someone put 1.25 ohms in series with the woofer to make it higher DCR. This is a 4 ohm speaker system (the tweeter is 8 ohms). Later the jumper was added presumably because the owner got an amp that would handle 4 ohms. I'll post the full saga with photos when there's more progress. Thats one hell of a crossover! Now you got me cuious, I want to check out the crossover in my subwoofer.